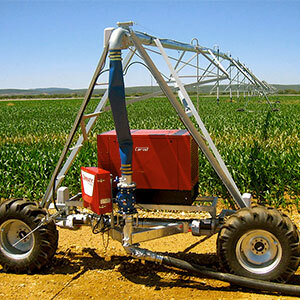 Wherever hand move aluminium sprinkler pipe is utilized for germination and/or crop production. Labor costs can be slashed up to 90%, and soil compaction from foot traffic needed for the installation and removal of hand move pipe during the production cycle is virtually eliminated. Plus, linear sprinkler application can be more finely tailored for windy conditions or difficult soils. Wherever the timing and uniformity of water and fertilizer application influences crop yield and quality. Carrots, potatoes, sugar beets, onions, garlic, tomatoes, cotton, and alfalfa are just a few of the crops which benefit in yield and quality from uniform application when “spoon feeding” water and nutrients from the time of germination all the way to harvest. Wherever water supplies are limited and/or expensive, and where application rates must be matched precisely to soil intake and crop use rates to prevent runoff. Improved water application uniformity reduces labor, energy, and water usage, while preventing runoff. Crop yields are maximized because precise amounts of water are applied when they will do the most good. Water application efficiency can be further enhanced where water availability is limited by using low drift nozzles, drop tubes, socks, and other sprinkler package options. Wherever soil conditions are too sandy or too heavy to accommodate other irrigation methods. Both light and heavy soils can be irrigated at the optimum frequency (timing) and depth of water application to optimize crop quality and yield, while preventing leaching loss in sandy soils or runoff in clay soils. Wherever ideal soil moisture content is an issue, for example around planting time or immediately prior to harvest. If applying a quick 0.25″ to 0.5″ of water over a field would help melt clods or prevent a crust, germination may also be enhanced. Improved placement and activation of soil applied herbicides is posible with linear irrigation. Soil moisture conditions can be improved prior to ripping and disking. A final irrigation can be properly timed to create ideal harvest condiitons, ease the digging of root crops, or help sod cutting.